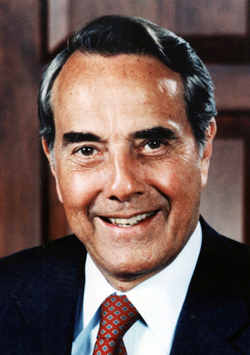 Bob Dole, one of the most prominent United States politicians of the last half century, will speak at Sam Houston State University Oct. 22. Dole's speech will be the 12th in the President's Speaker Series, which was begun in 2002 to bring speakers to campus who have lived successful and principled lives. It is scheduled for 10 - 11 a.m. in the Beto Criminal Justice Center's Killinger Auditorium. Born in Kansas and reared there during the Great Depression, Dole and his family lived in the basement of their home while the rest of it was rented out. He had a number of odd jobs to help earn money, including working as a soda jerk at the local drug store. He was an athlete in high school and at the University of Kansas, playing on his college's basketball team under legendary coach Phog Allen. He discontinued his law studies at Kansas in 1942 to join the U. S. Army. In April of 1945, while engaged in combat in the hills of northern Italy, he was hit by German machine gun fire in his upper right back. His right arm was also badly injured. He was twice decorated for heroism, receiving two Purple Hearts for his injuries, and the Bronze Star Medal with combat "V" for valor for his attempt to assist a downed radioman. After the war he continued his law studies and in 1950 was elected to the Kansas House of Representatives. He served eight years as a county attorney and in 1960 was elected to the U. S. House of Representatives. He was elected to the U. S. Senate in 1968, serving until 1996, when he resigned to focus on his campaign for the presidency. He held a number of powerful committee posts in the Senate, served as majority leader from 1985 until 1987 and 1995 to 1996, as well as minority leader from 1987 to 1995. In 1976 he ran unsuccessfully for vice president on a ticket headed by Gerald Ford. He ran for the 1980 Republican presidential nomination that was won by Ronald Reagan, for the 1988 nomination won by George H. W. Bush, and received the Republican nomination in 1996, losing to incumbent Bill Clinton. Since his retirement, Dole has worked part-time for a Washington, D.C., law firm, and pursued a second career of writing, consulting, public speaking, and television appearances. He has been seen on television in commercials for such products as Visa, Viagra, Dunkin' Donuts and Pepsi-Cola, and as an occasional political commentator on Larry King Live. President Clinton awarded him the Presidential Medal of Freedom in early 1997 for his service in the military and his political career. He received the American Patriot Award in 2004 for his lifelong dedication to America and his service in World War II. The Robert J. Dole Institute of Politics, housed on the University of Kansas campus in Lawrence, Kansas, was established to bring bipartisanship back to politics. The Institute opened in July 2003 to coincide with Dole's 80th birthday. In 2007, along with three other former U. S. Senate majority leaders, he established the Bipartisan Policy Center. He has written several books, including one on jokes told by the presidents of the United States. In 2005 he released his biography, "One Soldier's Story: A Memoir," which covers his World War II experiences and his battle to cope with his war injuries. Earlier this year President George W. Bush appointed Dole and Donna Shalala co-chairs of a commission to investigate problems at Walter Reed Army Medical Center. He is married to Elizabeth Dole, U. S. Senator from North Carolina. The President's Speaker Series is underwritten by the estate of Lu Ellen Gibbs. Previous speakers have included Gene Stallings, Debbie Fields, Dave Dravecky, David Robinson, James Haley, Mickey Herskowitz, Wallace Jefferson, Ken Jennings, Drayton McLane Jr., Sherron Watkins and Jackie Pflug.